Enjoy summer all year round in the prettiest pale yellow Butterfly Cottage. Trimmed with lilac and decorated with butterflies, dragonflies and flowers, this light and sunny playhouse is the perfect place to relax and dream the day away. 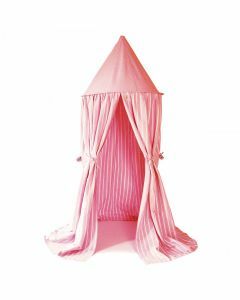 The playhouse is made with 100% cotton and comes with storage bag. The playhouse is easy to assembly with a light metal frame. The cottage is available in two different sizes, small (43"L X 29"W X 43"H) or large (52.5"L X 43"W X 65"H). Please choose the size from the drop down menu. Click on images for greater detail.